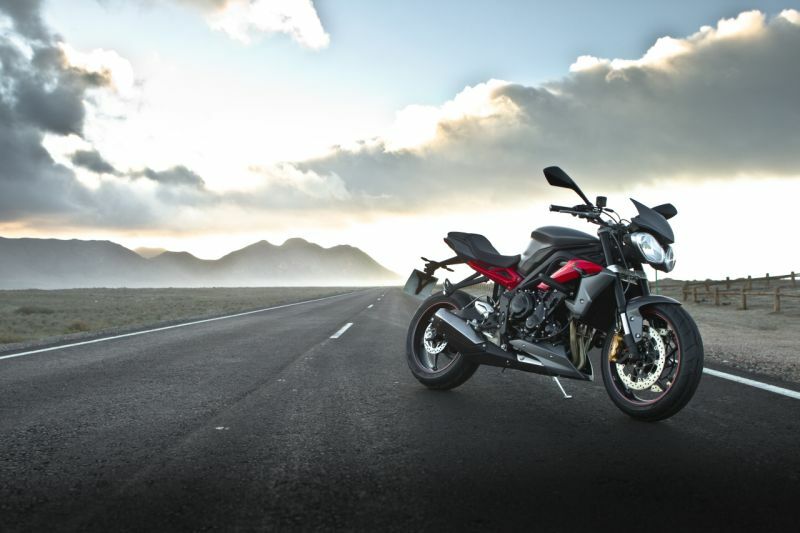 The Street Triple is the mass-market middleweight of Triumph’s range. With more than 50,000 standard and R models sold in five years, it’s Hinckley’s most popular bike. It’s as British and down to earth as fish-and-chips, wrapped in yesterday’s Daily Mirror newspaper and washed down with a mug of sweet tea. On this November afternoon I’m gripping the raised handlebar of a new Street Triple R as sunlight glints off its white tank. The view above the fly-screen shows Triumph’s Spanish test rider, Felipe Lopez, cranking an identical bike smoothly through a long, Armco-lined curve on the A-349 that carves through the parched landscape of Andalusia. He is followed by me and three other riders, two of whom have got their knees on the ground. This isn’t motorcycling’s equivalent of battered cod; it’s the chef’s special with a glass of Cava from a busy bistro in Felipe’s home town of Barcelona: nothing fancy, but exciting, rewarding and memorably good. If we’d been aboard open-class sports bikes we might have been riding even quicker, on the straight bits if not in the turns. Whether we’d have been having more fun is doubtful. The truth is that the original Street Triple – and especially the higher-spec Street Triple R – never were remotely ordinary. By de-tuning the Daytona 675 sportster’s engine slightly, removing its fairing and bolting on a one-piece handlebar and a pair of Speed Triple style headlights to produce the Street Triple in 2007, Triumph created a sublime blend of performance, character, light weight and agile handling.